Since its humble inception in 1888, in the rural farming community of Monroe, NC, Belk has grown into the nation’s largest, privately-owned mainline department store company, with nearly 300 fashion stores across 16 Southern states, and a thriving eCommerce website at Belk.com. The company offers the best in Modern. Southern. Style., housing many of the nation’s top fashion designer and national brands of cosmetics, apparel, accessories, shoes and home decor, as well as outstanding lines of private brand merchandise, both online and in stores. 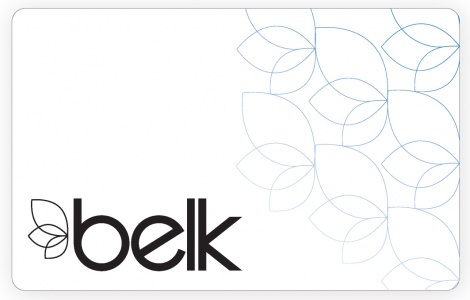 National Gift Card is the best place for you to order Belk gift cards in bulk. We are the experts in all things gift cards and can set up your gift card solutions program for you today. Please contact us for more information on Belk bulk, direct-to-recipient, or individual gift card fulfillment for your gift card program. Contact us here or call us at 888-472-8747 today! This card is redeemable only for merchandise at Belk, and is not refundable for cash unless required by law. No expiration date or fees apply. This card will not be replaced if lost or stolen. No value until activated. Use of this card constitutes acceptance of its full terms and conditions, found here: belk.com/giftcardterms. This card is issued by and represents an obligation solely of [BGCC LLC]. For Gift Card Balance or information: 1-800-474-6102.